It’s no secret that we Americans are the fattest and most impatient people on the face of the Earth, a deadly combination. Everything we eat is pre-packaged, processed, frozen, or fast. Nothing is fast enough for us, and everything is we do wastes time that could be spent doing something else that we think is important. I almost don’t have time to write this blog because I’m having a Big Mac attack. A few years ago, it was realized through the media that we have become a fast food nation and that far too many of our children are obese – we’re talking epidemic proportions here. Super-sized, if you will. 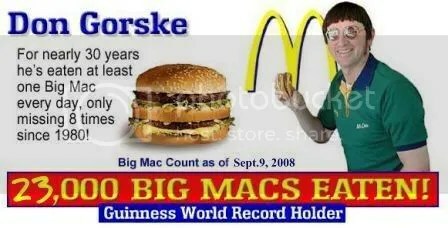 Speaking of which, this was also the time period that the independent documentary “Supersize Me” was released. It was because of this static that most of the fast food chains began releasing nutritional information and adding healthy (okay, healthy-er) food items to their menus. Let’s not kid ourselves, this was only to save face while under pressure from the public and the media – we needed help to not be so fat (because we don’t have the willpower to stop eating something named Big & Tasty). Consequently, McDonald’s adds an entire salad menu, yogurt, low fat ice cream; they also serve milk and orange juice, but not in a 32 oz. like the soft drinks. Most of the other chains followed suit, offering an array of salads, deli-style sandwiches, and alternative drink options. The static slowly decreased, and you don’t hear much these days about the obesity problem this country still has. The truth is, people who like McDonald’s Double Cheeseburgers aren’t going to suddenly start ordering the Premium Asian Salad with Grilled Chicken. I mean, come on – it doesn’t even come with fries. I also suspect that a salad connoisseur isn’t going to ditch Crispers, Sweet Tomatoes, or Panera for a McSalad. My favorite part of all of this are the new menu items that appear to be a healthier option, but aren’t. While doing some birthday shopping for Girlfriend in the mall yesterday, I stumbled across one such item (I won’t go into how I ended up in the vicinity). 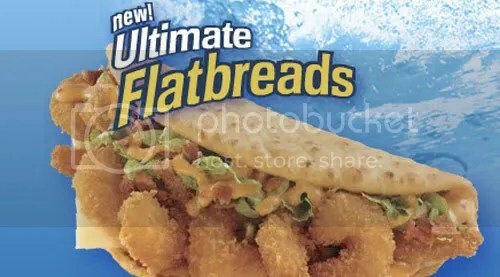 May I present to you Long John Silver’s new Ultimate Flatbreads! I’m sure you’re at least aware of their staple item, the deep-fried fish fillet with extra crunchy things. Now that I think of it, almost all of their items are deep-fried with extra crunchy things (except the cole slaw – yuck). Now, with the creation of the new Ultimate Flatbreads, LJS now has something for everybody. I’m sure you’ve seen those fresh-looking gyro sandwiches and pita bread sandwiches that are available at your healthier establishments and deli’s, right? Wipe the drool from your mouth and picture this: a round piece of flat pita bread, stuffed with lettuce, bacon pieces, melted cheese, and your choice of a deep-fried fish filet or several deep-fried shrimp (not sure about the extra crunchy things). Can you believe it? They managed to make their staple item look heatlhier while actually adding calories to it. It’s like a fried fish taco. Genius. I could live on those crunchies. 😛 But I’d be sure to wash it down with one piece of fish and one piece of chicken. Oh, and three shrimp. 😉 Damn I want that so bad now. And they can keep their flat bread. I try to eat healthy. For example, I really like taco salads (with extra meat and cheese). I wish pizza places would make a pizza salad so I could feel better about eating dough, meat and cheese. If they sprinkle a little lettuce on it, I’m sure it would suddenly become healthy. People in Chad refer to us as “Lard-mericans.” On an unrelated note, you’re a total piece of work. Um… thanks. Your music rocks, but you’re just freakin’ weird.